Our most advanced and accurate portable temperature calibrator with the widest available temperature range. One of its great features is the patented DLC system for perfect temperature uniformity in the insert – even when calibrating large sensors or many sensors at a time. The RTC Series also feature active dual- and triple-zone temperature control which provides excellent temperature homogeneity in the well. New RTC-187 with a range of -45 to 180°C! NEW!! Compatible with JofraCloud - our cloud-based solution for remote reading and setpoint entry. Click here to watch our video on how an RTC portable temperature calibrator and JofraCloud can help you work smarter. The RTC-159 is a portable temperature calibrator - ultra cooler - with a range of from -100 to 155ºC. Every part of a theromoelectric solar plant must be running properly to ensure maximum energy output. 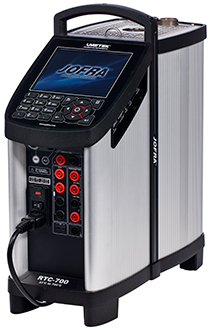 JOFRA calibration units are used to make sure that all sensors are correctly calibrated. By pre-calibrating temperature sensors in the laboratory, our pharmaceutical customers save time, increase accuracy, and minimize downtime. RTC-187 -45 to 180°C (-49 to 356°F), Dry Block. Use DLC-155. JofraCal (Free) - Calibration software for easy calibration of RTDs, thermocouples, transmitters, thermo switches, pressure gauges, and pressure switches. Use AMETRIM (Free) to adjust and calibrate your instrument.